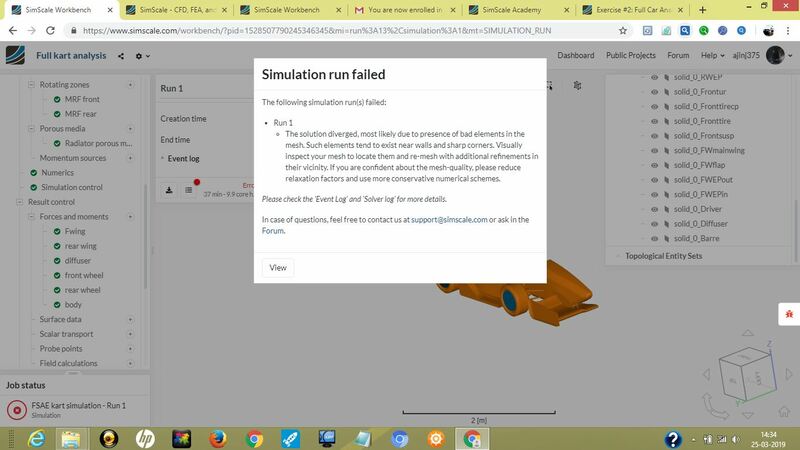 I am facing issues with the simulation run of the full kart analysis included in the FSAE workshop by simscale. 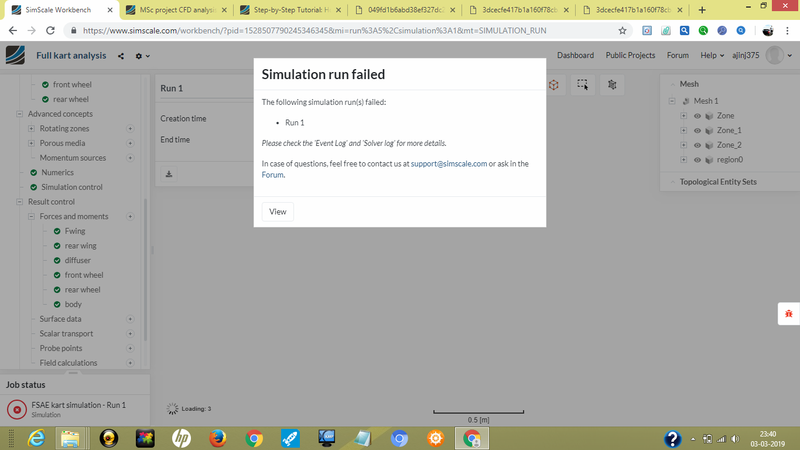 Being a beginner in CFD I can’t recognize the reason for that error. So getting a guidance will be a great help for me. I am attaching the link with this message. Very strange indeed, will check and get back to you as soon as I have found the issue. I just gave a try again and still I can’t get a positive result! Yes @jousefm it’s strange! I will give more tries but meanwhile a support from someone would be very useful for me. I will take a look into your project and will come back with a possible solution as soon as possible. Thanks a lot for finding some time for me! Is there any problem in setting the boundary of MRF zone as a moving wall? I have set the wheels in that manner. Thanks for quickly jumping in here Ani and sorry for not getting back to you @ajinj375! Will jump in if you need help Ani, keep me up-to-date! 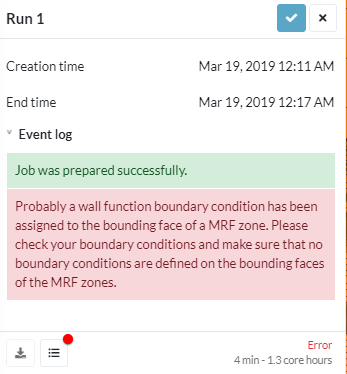 You have assigned a MRF zone as a wall. Just remove the zone-1 from the wall boundary conditions. Thanks for pointing me that mistake Ani, I have restarted the run and will get back to you after the completion. A tonne of thanks from my side! I haven’t forgot to tell you thanks for the support you were giving me! I think I needs some more help from you now. I have corrected the mistakes you have pointed out that day and now it’s different. I was iterating the simulation setups many times during last days and still the issue is present. Help me out of this problem Ani. @jousefm, it will be great to hear from you too my friend. We definitely have to fix the mesh! With over 700 illegal cells there is almost no way that the simulation will give you nice results (well, sometimes it does though…welcome to CFD!). I will have a look at the geometry & Mesh later and will tag our mesh guru and PowerUser @yosukegb4 here who might give you some quick tips in the meantime. Great to see you again! Thanks for pointing out things to me and as you have said I am just a beginner in CFD now and will definitely love to hear about the inner depths of the same. Yeah, it will be a matter of much interest for me to hear from @yosukegb4 about meshing. And one thing jousef, I got the model and settings from the simscale webminar series of Formula Student aerodynamics. So far I haven’t changed the mentioned settings in the support uploaded with the course content. I am a bit confused now and really in need of a good support like you. So keep pointing my mistakes so that I can improve myself in this field. where the stationary hub is connected to the rotating wheel (MRF zone). If that is the cause, there is a possibility to solve when the hub and the wheel are separated to create a space through which the fluid passes. Thanks for your kind support and a piece of information to do a study upon. Anyway I will keep trying to complete the simulation (haven’t found out a solution up to this time) and understand my mistakes. Helps from the community will be valued a lot. Thanks!